In small bowl, mix onion, honey, soy sauce, ketchup, oil, sesame oil and garlic. Set aside. Place chicken in 4- to 5-quart slow cooker. Pour honey mixture evenly over chicken. With slotted spoon, remove chicken from slow cooker, leaving sauce in cooker. In small bowl, stir cornstarch into water until dissolved. Pour into slow cooker; stir to combine with sauce. Cover; cook sauce on High heat setting 10 minutes longer or until sauce has thickened. While sauce is cooking, shred chicken with 2 forks. 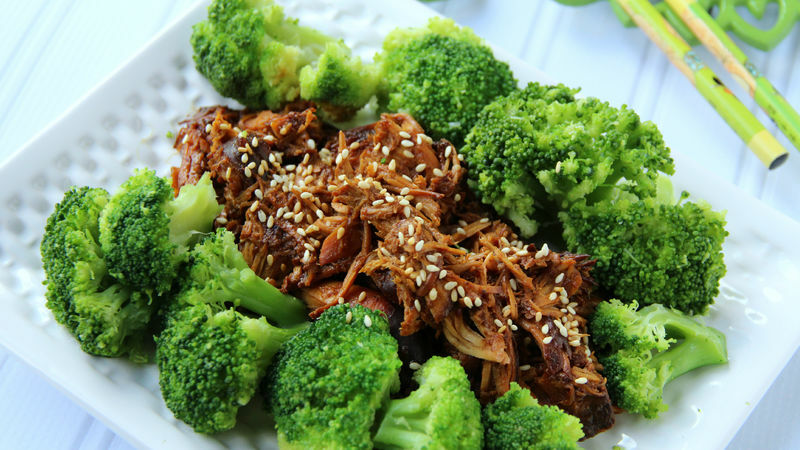 Return shredded chicken to slow cooker; toss with sauce. Sprinkle with sesame seed before serving. This chicken is great served with a side of cooked Valley Fresh Steamers® Select® frozen broccoli florets. If you want to add some spice to your Slow Cooker Sesame-Garlic Chicken, add 3/4 teaspoon of crushed red pepper flakes at the beginning of the cooking process. In a rush? You can cook this recipe on the High heat setting for 2 hours for a speedy version of this recipe.